Private Events Just Got Better! 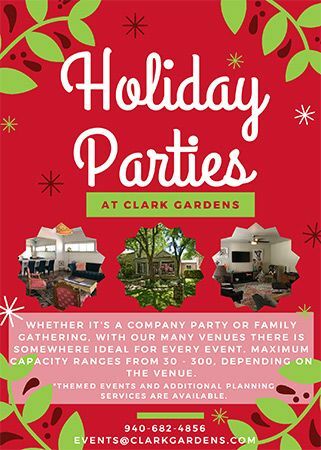 Clark Gardens has four air-conditioned indoor locations to accommodate groups, big and small. Taking Reservations Now for Your Amazing Holiday Party. For large or small groups, our stunning, secluded Retreat (pictured above) is a beautiful 4,000 square foot home with an indoor pool, a barbecue grill, a hot tub, multiple decks and one large outdoor table and several small tables as well. The spacious multi-level Retreat sleeps 10 and is perfect for a weekend getaway with friends or an exquisite event venue. This well-equipped haven is suited for a 50-75 persona indoor wedding, or an event hosting 150-200 guests when utilizing both the indoor and outdoor spaces. Located in the Garden with easy access to Lake Pavilion and Oxbow Lake, is the History House. The History House can be set up to your liking for a board meeting, luncheon, shower or birthday party. Located not 50 feet from the Model Train Station and Children's Play House, it's the perfect location for a child's birthday party. Heated and air-conditioned and adjacent to the restrooms, the History House allows for easy access (unload right in front) with guests parking nearby at the Garden's office. The Bridal Suite (pictured above), situated next to the Bowling Green and Arbor, received a complete facelift in January 2018. This is the perfect spot for luncheons, small dinners, and showers for up to 10-20 people. The suite comes with a mini-fridge and access to a covered patio with seating. The Cottage (pictured above) opened in August 2018. 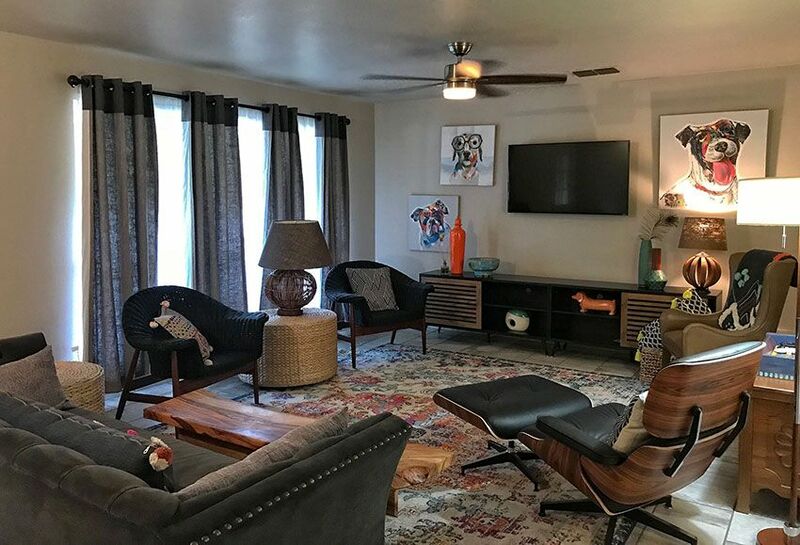 This charming 1,600 square foot home has been completely remodeled and upgraded with new appliances and beautiful modern furniture. The private house can sleep 6 and has 3 bedrooms and 2 baths. It has a large patio for dining and a big screen TV (great for watching sporting events or a favorite movie). The Cottage is perfect for luncheons, baby or bridal showers, board meetings and girls' getaways. The best part... it is only 50 feet from our beautiful gardens.